Toronto Dance Theatre presents an experimental double bill at the Winchester Street Theatre. Marie Lambin-Gagnon’s Slow Dance begins the night with a conversation between dancers and objects in an otherworldly environment. Followed by a reimagined This Shape, We Are In, choreographed by New York’s Jeanine Durning. Gold, glitter, tulle and a vast amount of colourful fabric transform the Toronto Dance Theatre studio into an alternate world. Dancers remain in stillness for an extended period, covered from head to toe in different textured fabrics. Slow Dance is precisely that, performers move with incredible control and resistance at a languid pace, eventually tearing down the entire set of random objects. The performance is only forty minutes in length and was performed by three dancers during my viewing (although the program lists four). My only wish for this piece would have been to be able to walk around and have a 360-degree view. I was unable to see one of the performers for a good chunk of the performance based on the initial staging. As the performers bow, their sweat is evident – although the choreography looks simple, moving at that slow of a pace with their incredible control displays the strength of the performers, who had an intense focus to match. I surprised at the end to see the performers were only wearing underwear, as through the performance they seemed always to be fully covered by the mass of objects in the space. This Shape, We Are In is unabashedly experimental, the dancers walk, shake and improvise gestures through the hour-long performance. 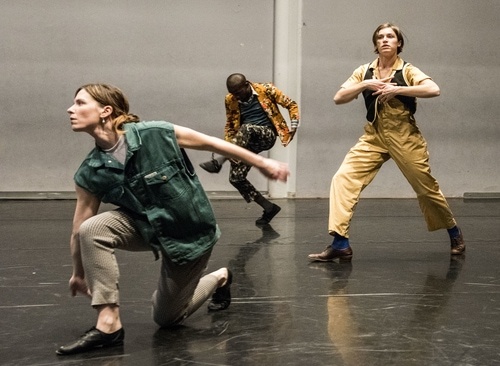 Originally performed in 2016 as part of a Toronto Dance Theatre international collaboration, this work was reimagined from a 30-minute work to an hour long repertoire. Although I did not see the original work, I believe this piece might have been better kept at 30 minutes. Although there were some interesting moments in the piece, overall I feel it fell flat and was overly repetitive. Durning does not want the audience to get comfortable, inviting them in to question ‘being’ in time, place, fate and togetherness. The house lights remain on for a majority of the performance and, the dancers stand closely and stare at the audience or speak directly to them. Theatregoers interested in experimental and metaphysical work may enjoy this performance, but it was not my cup of tea. As a long time Toronto Dance Theatre fan, I may wait till I see the Artistic Director, Christopher House, billed as a choreographer before getting tickets to their next performance. Slow Dance and This Shape, We are In are playing at the Winchester Street Theatre through February 2, 2019. Slow Dance performs nightly 7:00 pm, followed by This Shape, We Are In at 8:00 pm. Matinee performances are available on weekends at various times. Tickets $20 – $30 per performance, Each performance requires a ticket. Photo of Alana Elmer, Pulga Muchochoma and Mairi Greig, in This Shape, We Are In by Omer K Yukseker.